Would you believe that 60 to 90 percent of restaurants close within the first year of operation? If so, you’d be wrong — thankfully. Economists recently disproved this popular myth, finding that, in fact, the percentage of restaurants that fail in the first year is equal to or lower than other service-related industries. Even so, this still means that of the over a million restaurants in the United States, a significant number of those will close this year. How do you keep your establishment from becoming a statistic? If you’re starting to see a decline in sales or a decrease in return customers, or if you’re getting fewer online reviews — or worse, more negative reviews — it’s time to make some changes, and fast. Luckily, here are a few relatively inexpensive but high-impact improvements you can easily make to keep your front of the house fresh and exciting for your repeat customers and create buzz to attract new ones. When it comes to your restaurant’s branding, you probably know how that the colors you select are crucial. Consumers make decisions on both a conscious and subconscious level based on color. Not only are people drawn to colors they love, but certain colors just naturally evoke emotions and trigger responses. For example, red is known to create energy and stimulate the appetite, while green conveys an impression of health and eco-friendliness. Does this mean that you should paint your restaurant red and green? Unless your eatery is serving Christmas-themed fare, probably not. Instead, use a fresh coat of paint and strategically placed pops of your brand’s signature or complementary colors to brighten, refresh, or completely transform the front of your restaurant — and perhaps even your outdoor storefront. Think about how you want your customers to feel while dining with you. If you’re trying to evoke a relaxed, romantic atmosphere, opt for neutral colors over brights, but if your restaurant blasts fast-paced music and encourages fun and high-energy experiences, brights are your best bet. Have you paid much attention to your plates lately? How about your glassware, napkins, or utensils? If not, now is the time to take a closer look. Chipped plates, cloudy glasses, bent silverware, or dirty linens create a terrible first impression — one that might mean a final visit. Getting your team to step up their cleaning game is definitely in order, but you should probably also explore upgrading the quality of your tableware. The wholesale restaurant supplies that are available online today offer a wide range of styles, pricing, and durability — from chip-resistant plates to forks and knives that feel expensive but really aren’t. 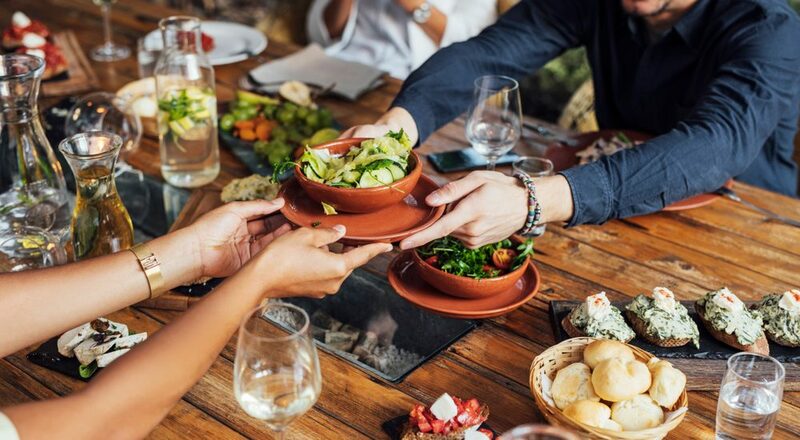 Trends change — even in tableware — so updating your signature servingware from a traditional round white plate to a funky square or rectangular black piece will show your patrons that you and your restaurant are keeping up with the times. Although it sounds contradictory, paring down your front of the house is actually a great way to impress today’s customers. Most people appreciate business owners’ efforts to respect the environment and reduce waste. Simple measures like trading heavy tablecloths for recyclable placemats, eliminating sticky plastic-encased menus for a menu board or menus printed on “green” paper will breathe new life into your restaurant’s look and feel. Removing excess decor, unnecessary pieces of furniture, and any and all clutter will give you more room to do what you do best — serve your customers. At the same time, perform a thorough top-to-bottom cleaning of your dining area, including furniture, floors, walls, and fixtures and make any repairs you’ve put off for a later time, like leveling a wobbly table or fixing a tear in the fabric of a seat cushion. Your efforts will be noticed, and appreciated as your patrons enjoy the perception (and reality) of a clean, simplified, spacious dining experience.